Legendary NASA Astronaut Story Musgrave spoke on Saturday at Bok Tower Gardens’ Dark Sky celebration. 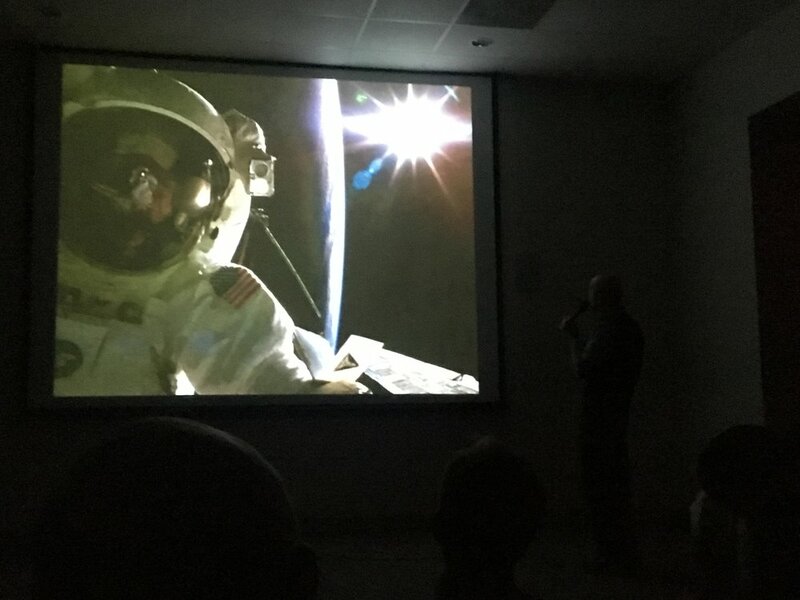 Having never met the six-time Shuttle veteran, I had to see his lecture, especially since he doesn’t do as many speaking engagements compared to other astronauts. Musgrave remains the most formally-educated astronaut NASA ever had, with two Bachelor’s degrees, three Master’s degrees, and a Doctorate of Medicine. In this capacity, he has authored over 25 scientific papers. Musgrave also served in the United States Marine Corps. Selected in Astronaut Group 6, the second group of scientist astronauts, Musgrave began his NASA career in 1967, first working on the Skylab program and serving as a backup crewmember. He subsequently worked in the design and development of the Space Shuttle, including such hardware as EVA equipment, airlocks, and life support equipment, also frequently serving as CAPCOM in Mission Control. He would also become a frequent-flyer on the Shuttle, starting with his first mission in 1983, STS-6, followed by STS-51-F, STS-33, STS-44, STS-61, and finally STS-80 in 1996. Musgrave is the only astronaut to have flown on all five Shuttle Orbiters. He also flew on both a DOD mission and a Hubble servicing mission, and is one of the few people to have launched into space six times. Needless to say, just being in the presence of Story Musgrave is a true honor. On this occasion, Musgrave would be speaking about one of his many specialties, photography, catering to the audience of astronomers and astrophotographers at the dark sky event. How many photographers can go from a shot of a volcanic eruption straight to a shot of a volcanic eruption seen from space? Story can! His shots from orbit were mesmerizing, and yet so were his creative and expertly-captured earthbound images, such as the one below. His two favorite vehicles to photograph are the T-38, a high-performance trainer NASA lends to its astronauts, and the Shuttle Orbiter. This shot at Edwards Air Force Base is like something out of science fiction. Even for his images captured years ago, particularly black and white rolls and images with reflection in water, Musgrave exudes an infectious sense of sheer joy and astonishment at the beauty of planet Earth. His descriptions of the photos are interlaced with such exclamations as “I can hardly stand to look at it, it’s so beautiful,” “this was an unbelievable sight,” or “gosh, look at that!” Not excluded from these interjections are a series of photos showing phytoplankton in the ocean, seen from Earth orbit. Musgrave explained how these microscopic organisms in the ocean, invisible to the naked eye except in large numbers, provide half the photosynthetic activity on Earth, sustaining life in both the ocean and on land. He also noted how their movements indicate underwater ocean currents. Ice floes also move with the currents of the ocean, and in the series of photographs of which they were the subject, Musgrave emphasized how there are no clouds in the images, just ice. We were also treated to images of aurorae seen from Earth orbit, which sometimes extend far enough out for spacecraft such as the Shuttle to actually fly through. On a related note, Musgrave was also the first to photograph a sprite, lightning striking towards the upper atmosphere, from above. There was no shortage of photography showing the spacecraft and missions he flew. Perhaps the most awe-inspiring were those of Musgrave and his colleagues during their EVAs repairing the Hubble Space Telescope. My favorite is this photo of Musgrave with Earth and the Sun in the background. Looking closely, his face and snoopy cap are visible through the helmet visor, along with his fellow EVA companion taking the picture. After the presentation, Musgrave did a meet-and-greet, taking the time to speak with every person who asked him. Once it was my turn, I knew exactly what I had to ask. Astronaut Tom Jones, his STS-80 crewmate, once mentioned to me that Musgrave had gone through the entire re-entry and landing standing up in the Orbiter’s flight deck – a little prerogative he created since it was his last mission before retirement. This was no easy task, however. Having spent over 17 days in microgravity, how was he able to withstand the G-forces and aerodynamic turbulence of an entry into Earth’s atmosphere? Of course I believed it happened, but I had to ask him about it for myself. Story related that he was not only standing up, but facing backwards as well! He braced himself against the back of his seat, looking through the flight deck’s aft windows. By doing so, he became the first person, and most likely only person, to look directly into the Shuttle’s plasma trail. It must have been a truly awesome sight to behold. Story Musgrave and the Author, following the former’s presentation. Having met Musgrave and seen the universe through his eyes, I am looking forward to picking up the copy of his book on my shelf and giving it a close read. Just as I have given a teaser of his lecture, his lecture was just a teaser of his extraordinary career. Cover image – NASA STS061-98-050 – Musgrave (above) and Hoffman (below) work on Hubble during STS-61, over the south coast of Australia. Musgrave, Story. 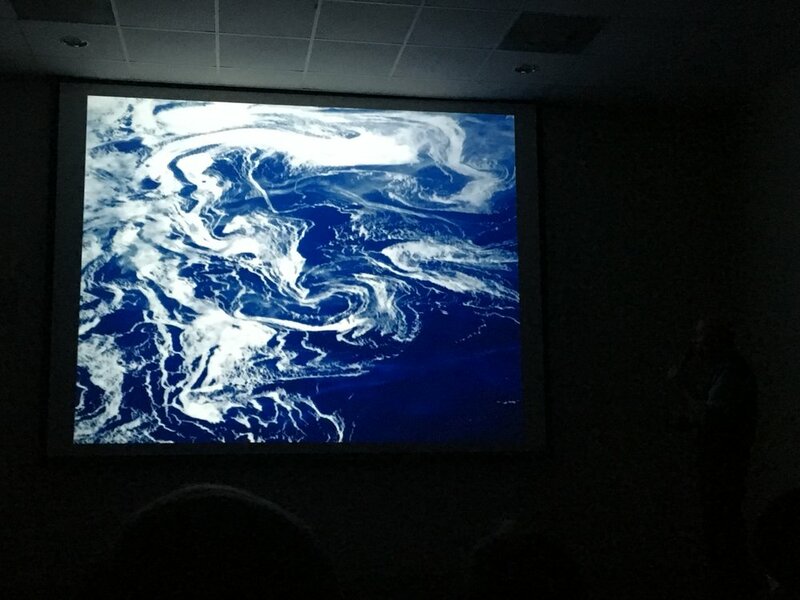 “Adventures with Light.” Lecture, Harmony Dark Sky Party, Bok Tower Gardens, Lake Wales, FL, February 2, 2019. “Story Musgrave (M.D. ).” jsc.nasa.gov. August 1997. https://www.jsc.nasa.gov/Bios/htmlbios/musgrave.html.